Kota Kinabalu (Tuesday) - In supporting the development of local entrepreneurs, the Sabah Economic Development and Investment Authority (SEDIA) regularly provides Small and Medium Enterprises (SMEs) with avenues to showcase their locally-developed products. During the recent weekend, various entrepreneurs were given promotion space at two separate exhibition events: the Annual State Statutory Bodies and Government Agencies exhibition held at Suria Sabah shopping centre during September 29-30, 2018; and the state-level Farmers, Breeders and Fishermen Day Innovation and Sales Exhibition of Agriculture Products held at Tawau Municipal Council Field during September 28-30, 2018. At the event held at Suria Sabah, SEDIA provided booth space for 20 entrepreneurs, while at the Tawau event there were as many as eight entrepreneurs promoting their products at the SEDIA booth. The local products promoted during both exhibitions range from local food and beverage products, supplement and health products, essential oils, and cosmetic products for body and skin care. The initiatives by SEDIA support, and are aligned with, the State and Federal governments' efforts and initiatives to develop local and bumiputera SMEs, so as to increase the number of locally developed businesses, products and services. SEDIA continues to work closely with government agencies at the State and Federal level; over the past years, SEDIA has been participating in exhibitions and expositions both locally and internationally, working closely with MITI as well as MIDA, MATRADE and other investment promotion agencies in investment promotion activities. These efforts include overseas trade and investment missions, welcoming courtesy visits by representatives and business delegations of foreign countries, attending meetings and promotion-related events at the national and international level, and to explore and attract the many forms of investments from around the globe. 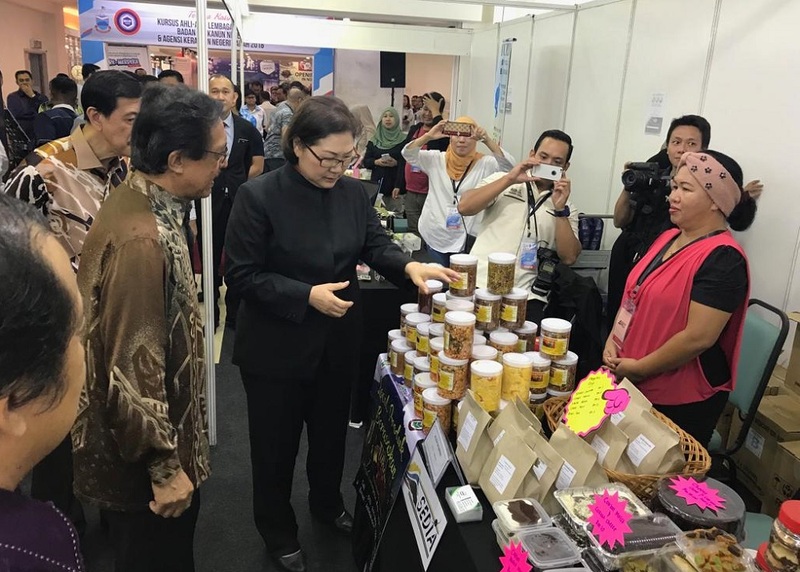 The entrepreneur products showcased at the SEDIA booths are the result of SMEs that had undergone the Sabah Development Corridor (SDC) SME Incubation programme. Through this programme, SEDIA assists entrepreneurs in various capacities including but not limited to business licensing, product packaging, skills development, networking, and product certification. SEDIA also established the SDC Entrepreneurs Business Portal or SDC Bizlink, with the objective to help promote and sell SDC entrepreneurs' products. SEDIA continues to encourage SDC entrepreneurs to market their product via SDC Bizlink, and currently over 20 'Made in Sabah' products are available at www.sdcsabah.com. SDC was launched on January 29, 2008 during the Ninth Malaysia Plan as one of Malaysia's five regional economic corridors, with the aim to accelerate the growth of Sabah's economy, promote regional balance and bridge the urban-rural divide, while ensuring sustainable management of state resources. This was followed by the establishment of SEDIA, through the adoption of the Sabah Economic Development and Investment Authority Enactment 2009 on January 15, 2009. Through the enactment, SEDIA is vested with the necessary power to serve as a decision-making and execution institution that is tasked with realising the SDC vision and mission, by being the One-Stop Authority to plan, coordinate, promote and accelerate the development of SDC. Realising the potential of SME contributions to the state economy, SEDIA had developed initiatives for and have been actively involved in SME development in Sabah since during the Second Phase of SDC (2011-2015) and into the current Third and final Phase of SDC (2016-2025). The SME programmes are also in line with one of the three principles of SDC, which is capturing economic value activities. The SDC SME programmes are to help entrepreneurs, start-ups and companies to discover business ideas, validate as well as scale up their ventures. A crucial component of SDC SME programmes is the SDC SME Incubator programme, of which include the SDC entrepreneurs that are participating in SIFBF 2018. The Incubation programme is conducted over a two-year period through two types of setups, namely In-Situ and Ex-Situ Incubation, based on their location. As at July 2018, there are a total of 259 In-Situ and Ex-Situ incubatees, and a total of RM11.86 million in grants approved for these incubatees. In-Situ Incubation is hosted at the Sabah Agro-Industrial Precinct (SAIP), supported by shared basic facilities such as R&D laboratories, controlled environment farming, post-harvest handling facilities and collection centre, production line facilities, and the administration building. The incubatees get access to technical and business advisory services from business development and technical officers stationed in SAIP. The Ex-Situ Incubation programme is created to cater for SMEs stationed outside of SAIP (i.e. other districts of Sabah). However, the Ex-Situ participants are also members of SAIP, as they can access and utilise SAIP facilities as well as other supporting systems, on an appointment basis. In this arrangement, incubatees need to identify and acquire their premises or potential premises, as a pre-requisite to be qualified for the programme. They are guided by SEDIA's officers on a periodic basis.